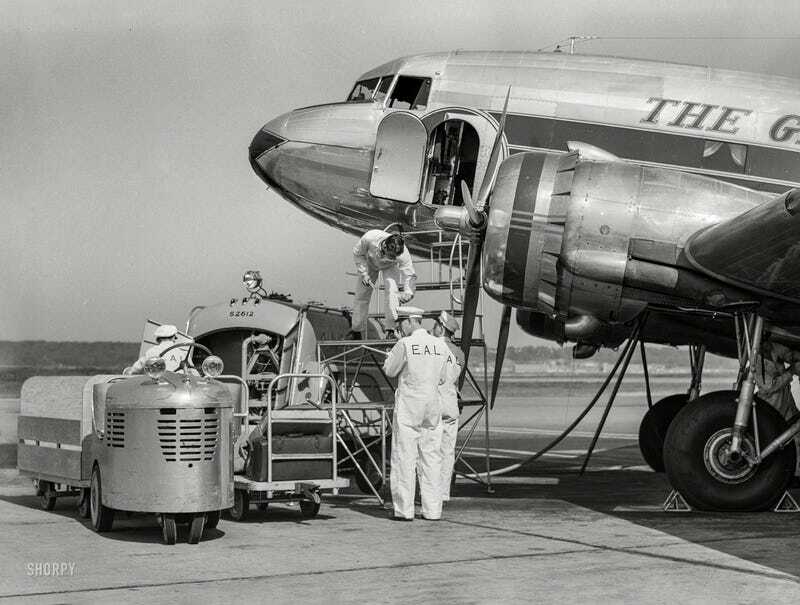 Fueling up an Eastern Airlines DC-3 at National Airport in Washington, DC in 1941. Former WWI ace Eddie Rickenbacker had taken over the reins of Eastern from General Motors in 1938 and greatly expanded its service over the East Coast with aircraft of The Great Silver Fleet. Under Rickenbacker’s leadership, Eastern’s virtual monopoly on the lucrative routes between New York and Florida made it the nation’s most profitable airline. By the 1950s, though, Rickenbacker’s reluctance to adopt jet aircraft led to his ouster. Eastern remained profitable as it moved into the jet age, and was the first to fly the Boeing 727, the Airbus A300, and was the launch customer for the Boeing 757. But a steady decline beginning in the 1970s ended with its liquidation in 1991.